Categories: Surgical Instruments , Did You Know? Inox, Titanium, Dumoxel®, Dumastar®, Antimagnetic... Have you ever looked at the variety of metal alloys for surgical instruments and laboratory tools and wondered which is best for your needs? Here's a brief rundown. Stainless Steel (Inox) - Our standard line of instruments are manufactured of highest quality materials, they are made of austenitic 316 steel commonly known as “surgical steel” or “marine grade steel.” Stainless steel, also known as Inox (from the French word "inoxydable"), is highly corrosion resistant and it is a common choice of material for biomedical implants or body piercing jewelery. It is in compliance with ASTM F138. This WPI line is an excellent alternative to German surgical instruments. The high-quality, corrosion-resistant instruments are available at a fraction of the price of German surgical instruments, which are also manufactured from the same type of steel. Stainless steel is well suited for medical purposes, because this stainless steel, magnetic alloy has excellent corrosion resistance and good salt resistance. Temperature resistant up to 400°C, it can be autoclaved at 180°C. Almost as strong as carbon steel, Inox is an excellent general-purpose alloy for surgical instruments. Titanium - 100% anti-magnetic, corrosion-resistant, lightweight and strong, Titanium alloy is ideal for biological and medical applications. Titanium has the tensile strength of carbon steel and is completely resistant to corrosion from nitric acid, chloride, saltwater, and industrial and organic chemicals. Titanium is more flexible and 40% lighter than Inox. When heated or cooled, the dimensions of Titanium alloy change less than half of what stainless steel alloys will, making Titanium surgical instruments much more durable. Titanium is stain-free and temperature resistant up to 430°C. Titanium tools are the premium choice for corrosive environments or MRI applications. Dumoxel® - Developed by Dumont Tools, Dumoxel is highly resistant to sulphuric environments, hydrochloric acid, mineral and organic acids. Extremely flexible, Dumoxel is 95% antimagnetic and stain resistant. Temperature resistant up to 400°C, it can be autoclaved at 270°C. Dumoxel is the most popular Dumont alloy for tools. Dumostar® - Patented by Dumont Tools, Dumostar is more elastic and more corrosion-resistant than the best stainless steel. It is resistant to mineral and organic acids and salt corrosion. Dumostar is 100% anti-magnetic and temperature resistant up to 500°C. Dumostar is the most cost-effective and appropriate alloy for laboratory tools. Antimagnetic - With good corrosion resistance, this alloy is 80% antimagnetic. Temperature resistant up to 400°C, it can be autoclaved at 270°C. Antimagnetic is not quite as hard as Inox. Tungsten Carbide - As a general rule, surgical instruments made of tungsten carbide performing the same type of work will last up to five time longer than stainless steel instruments. The additional length of service makes tungsten carbide surgical instruments more cost effective than cheaper models. We guarantee our instruments to be free from any material defects. If any defects are found we will replace or repair at our discretion, free of charge. The one year warranty remains in effect for as long as the surgical instrument or product is used for its intended purpose with proper care maintained. 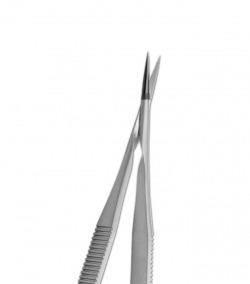 WPI carries a full line of surgical instruments, including the famous Swiss made Dumont Tweezers.